Does Green Tea Block Iron & B12? Drinking green tea does interfere with nutrient absorption. Anti-oxidants such as polyphenols in green tea can bind iron, inhibiting its intestinal absorption. You may also have trouble absorbing vitamin B12. To maximize your vitamin and mineral absorption from the diet, concomitant intake of green tea should be avoided. Green tea contains tannin that blocks the absorption of iron from food and supplements, according to the National Institute of Health's MedlinePlus. Adding lemon or drinking tea between meals will counteract this problem. Lemon contains vitamin C that enhances iron absorption. Women who are pregnant and nursing mothers should avoid green tea. Tannin can be transmitted to your child through your breast milk. This can cause impaired iron metabolism and microcytic anemia in infants. Drinking green tea slows down the absorption of iron; however, studies have shown no relationship between drinking moderate amounts of green tea and iron depletion. 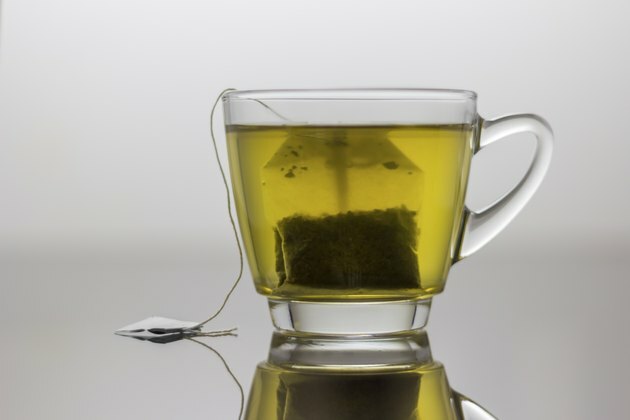 Belgium researchers at Katholieke Universiteit Leuven found that green tea consumption does not decrease the amount of iron stored in your body. The result of this study was published in the May 2002 issue of "European Journal of Clinical Nutrition." Green contains caffeine that has a diuretic effect. As a result, you may urinate more often than usual. Increasing urination removes water-soluble vitamins such as vitamin B12 from your body. Moreover, caffeine can impair the metabolism of vitamin B12, leading to deficiency. However, caffeine encourages the production of stomach acid that may help your body absorb vitamin B12 from your diet, according to "Medical Biochemistry: Human Metabolism in Health and Disease." Studies suggest that green tea is moderately safe and causes only minor side effects such as stomach upset, heartburn, diarrhea and irritation of the mouth. Green tea is not safe to use during pregnancy. It can cause severe birth defects of the brain and spinal cord known as neural tube defects. How Many Calories in a Cup of Decaf Coffee? What Causes Green Stools in Kids?